Two of my large stanhopea species failed to flower well this summer. Not surprising, really, as they hadn’t been re-potted for about ten years, and their baskets were full of back-bulbs! I hadn’t bothered to re-pot while they continued to flower well but obviously the time had arrived when re-potting was essential. The main reason that I’d delayed this task was that many of the new growths had made their way between the struts of the wire basket, and large parts of the plant were growing outside the confines of the baskets. The only way to remove these plants without damage was first to dismantle the basket, using bolt cutters. An expensive exercise, if I hadn’t taken advantage of the council’s recent “hard rubbish” collection day to acquire several wire baskets that less frugal fellow residents had discarded! Next I needed to acquire suitable material to line the new baskets. Again, this was accomplished at no expense, thanks to the council’s generosity in providing several paperbark trees in a nearby street! These trees shed their outermost layers of bark in summer, and you can easily find the odd sheet lying on the nature strip. If you intend to strip a piece from the tree, perhaps you should do it at night, when you’re less easily recognised by the neighbours! The only problem associated with the use of paperbark as a basket liner is in deciding how many layers one should use. Too few and the paperbark decays prematurely, allowing the potting mix to escape. 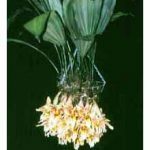 Too many, and the descending flower spikes are unable to force their way through the liner. Short of re-potting your stanhopeas every year, there’s no way to determine how many spikes (if any) have aborted. I usually choose strips of bark about 1 mm thick and hope for the best! If you need to buy new baskets, choose those with large gaps between the wires or bars. Stanhopea spikes have no sense, and are just as likely to head straight for the wires or bars, rather than for the gaps between them. As often as not, they then abort. Also, choose a shallow basket, rather than a deep one. 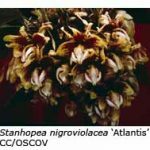 The reason is that stanhopea spikes are said to abort if required to force their way through more than about 100 mm of potting mix before they encounter the liner. I overcome this difficulty, if deep baskets are the only ones available, by planting my stanhopeas near the edge of the basket, so that the flower spikes emerge through the side, rather than the bottom. In the past I’ve had satisfactory results using 5-10 mm pine bark as potting medium, but this year I’ve also potted a couple of my stanhopea divisions in a mix of the currently fashionable coconut husks and perlite (4:1). 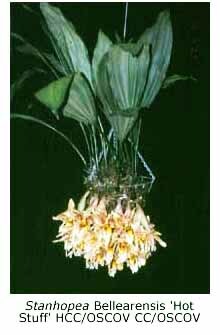 My baskets are hung from the shade-house roof, above the cymbidiums. Only a few stanhopeas are suitable for shade-house culture in Melbourne, most needing the luxury of a heated glasshouse during the colder months. Stanhopea nigroviolacea, S. tigrina and S. wardii flower well for me in the shade-house and S. oculata may also be OK, although my immature plant has flowered only once, last year. The hybrid Stanhopea Spindleriana (S. oculata x S. tigrina) also grows and flowers well without heat. Incidentally, this hybrid was first made 120 years ago (by the English nurseryman James Veitch in 1885). Stanhopea flowers may last a few days only but they create more interest in that short time than do many other orchids that last for weeks. It’s an achievement when one succeeds in bringing a flowering stanhopea to an orchid meeting. By the law of averages, it happens only once every ten years, if you grow only one plant and belong to only one society! 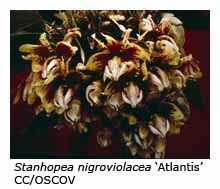 Transporting stanhopeas without damage to their pendant flowers is a challenge; new growers will soon discover that it’s necessary to drive with the car windows open to avoid choking on the overpowering “perfume”.